Forage particle length: Is longer really better? Physically effective fiber (peNDF) is important for maintaining good rumination activity, rumen function, milkfat content and yield, and cow health. Particle length has long been thought to be the major factor influencing forage peNDF, while NDF and lignin contents are now understood to be important factors also. Fine chopping reduces forage particle length, and thus can reduce dietary peNDF. Forages are relied upon to provide most of the dietary peNDF, since other than whole cottonseed, high-fiber by-products are usually finely ground. Forage chop length guidelines have historically been targeted for the minimum theoretical length of cut (TLOC) setting on the chopper necessary to provide adequate forage particle length and peNDF for the cow. This was largely because of concern that chopping at too great a TLOC could reduce silo packing density and kernel processing, adversely affect silage fermentation, elevate silo losses, extend eating time, and promote sorting in the feedbunk. So, TLOC guidelines remain a balancing act between forage, silo, feedbunk, and cow considerations. In recent years, there has been interest in increasing TLOC to lengths greater than traditionally accepted norms; for example, 26 versus 19 millimeters (mm; 1 versus 3/4 inch) for processed corn silage. Farms feeding most of their forage as corn silage, desiring more peNDF in the silage to displace dry hay or straw from the total mixed ration (TMR), expressed the most interest. But is the longer chop to lengthen forage particle size really better for the cow? Many years ago we published results from a UW-Madison feeding trial comparing long versus chopped dry alfalfa hay. At various times during the experiment, we emptied rumens, fed the treatment hays, and manually collected the masticated boluses of ingested hays as they passed from the esophagus to the reticulo-rumen. Particle length of the ingested masticates and the rumen digesta were similar for the long and chopped hay treatments. Also, there was little difference in particle length between the chopped hay and its ingested masticate. Dry matter contents of the ingested masticates were similar for the long and chopped hay treatments at only 23 percent, on average, resulting from saliva flow. The initial chewing during eating reduced particle length and raised the moisture content to where the bolus could be easily swallowed. Rather than particle length of the forage fed, this critical particle length needed for swallowing the masticated bolus determined the length of particles that actually entered the rumen to be available for maintaining rumination activity and consistency of the fiber mat. Results of that experiment suggested that above the particle length necessary for swallowing the masticated bolus by the cow, there might be little added benefit to increasing forage or TMR particle length. More recently, researchers from Italy, Cornell University, and the University of Pennsylvania Veterinary School collaborated on a research publication that confirmed and expanded these observations in a more detailed experiment. Methods for feeding and collection of masticated boluses were similar across experiments. Feed treatments were as follows: six different particle length ryegrass hays, one grass silage, one corn silage, and one TMR. Results are in the table. Length of particles entering the rumen in the masticated bolus was not closely related to feed particle length. The critical mean particle length for swallowing the masticated bolus was 10 to 11 mm. While greater forage particle lengths may extend eating time, rumination time and fiber mat formation would not be affected since particles entering the rumen are of similar size due to the initial mastication during eating. Eating time in lactating dairy cows is only three to four hours per day, while the normal time spent ruminating is about eight hours per day. Time spent ruminating is the major chewing activity contributor to peNDF. Fine chopping forages to lengths at or below the critical size for swallowing the bolus, however, would reduce both eating and rumination times and thus peNDF. Results from these experiments raise questions about the practice of longer chopping of forages. We conducted two feeding trials with lactating dairy cows comparing 26 or 30 mm TLOC in processed corn silage to the more conventional 19 mm TLOC. While the as-fed percentages of corn silage and resulting TMR on the top screen of the Penn State Particle Separator (PSPS) were greater for the longer chop corn silage treatments, the percentages on the PSPS top two screens combined were similar. Field nutritionists often use the PSPS combined top two screen proportions as their forage- or TMR-based indicator of peNDF. We observed no improvements in milkfat content or rumination time, the cow-based indicators of peNDF, for the longer chop treatments. More research is needed on longer chopping if the practice continues to be of interest to dairy managers and their consultants. The major potential pitfalls of chopping at too great a TLOC include poor packing in the silo and more sorting in the feedbunk and, in the case of corn silage, poor kernel processing. These were all assessed in our studies and were unaffected by the long-chop treatments. Whether or not issues in these areas emerge for long-chop silages most likely depends on silage and TMR moisture contents (drier forage is more challenging), harvest equipment type and setup, and management of the silo packing and TMR mixing/delivery processes. Consider these factors when fine-tuning TLOC settings on choppers. Also, keep in mind that silo baggers and defacers and TMR mixers may reduce silage particle size post-chopping, depending on equipment type and how they are used. Many research trials indicate that cows can sort against long particles. 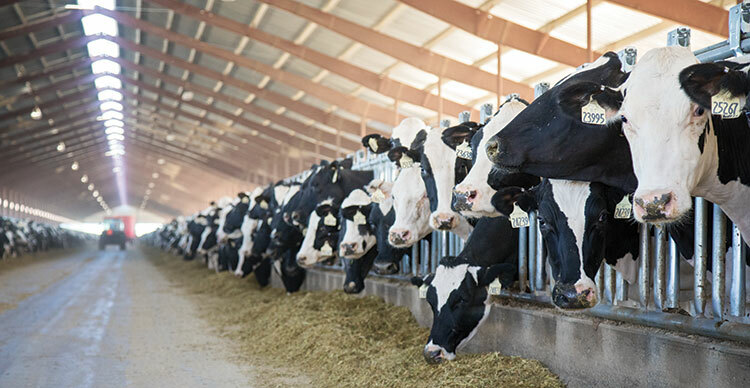 From his research on feed sorting, UW-Madison Professor Lou Armentano suggests that cows most easily sort particles wider than half the width of their muzzle or particles that are about 3 inches or more in length. Staying below this particle length threshold is especially important when processing dry hay or straw into a TMR. Feed sorting is an important monitoring check, especially for a TMR with a high proportion of long particles. This article appeared in the November 2017 issue of Hay & Forage Grower on pages 14 and 15.